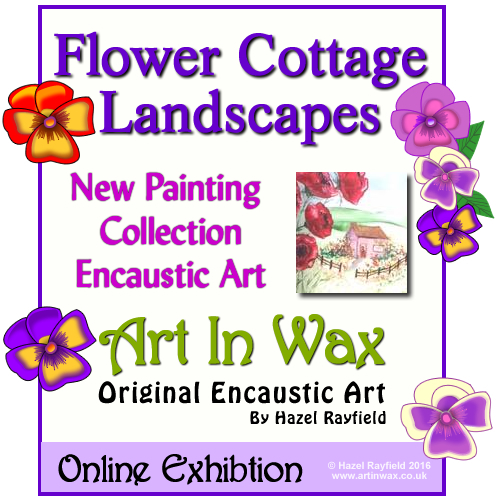 This online feature for the Art In Wax exhibition page brings together my love of painting in miniature and my love of painting flowers. The collection, which can ve viewed online on my exhibition page : https://www.artinwax.co.uk/exhibit-flower-cottage-landscapes.php, comprises of six paintings, each A6 in size (so approx. 6 x 4 inches) each, and features a miniature cottage painting with a foreground of vibrant flowers. My miniature paintings especially my tiny “Dolls House Art” are very popular, I am proud that in the past few years several hundred of my small paintings have travelled to new dolls house homes and miniature collections across the world, I still paint larger pieces and these too continue to be as popular as ever. I have, painted miniature versions of my larger pieces of art at different times, all my art is original, some inspired by nature and some just from my imagination. I don’t create prints or paint reproductions. Some of my art has a theme but no two paintings are them same even if in a similar theme. I have sold larger pieces and miniature similar versions, which have been sold as sets, “one for you home and one for your dollhouse” !! 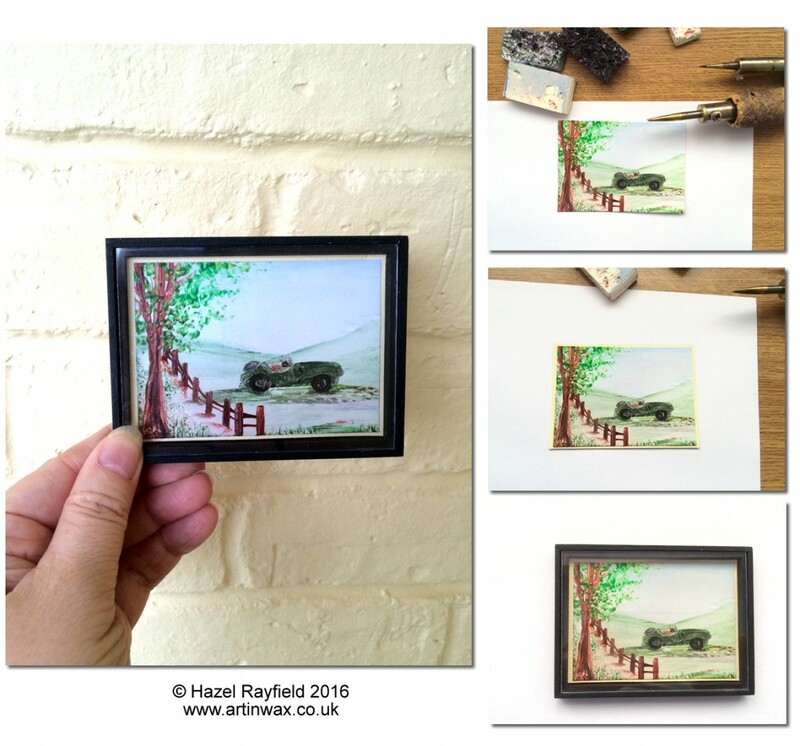 I have also sold a few of these my “miniature meets wall art” paintings, in the same theme as this collection, so I thought it would be fun to work on a collection in this style for an exhibit feature, and as you can see below this is what I came up with …. These paintings are for sale, this are painted on encaustic gloss card and backed with a coloured card, they are signed on the back and are £10 each plus postage and packaging. With father’s day approaching I thought I would try something different, so this miniature painting is for my Dad. Its a landscape with a green vintage car, its not a specific car, we can in trouble saying its based on this or that but its in the style of a vintage car and my Dad will know what I was implying !!! I have painted the picture on my encaustic card then layered it onto a linen textured card to give the effect of a mount then it has been framed in a handmade wooden frame (I recently commissioned this and several other frames in different sizes, colours and styles from a craftsman here in the UK). This frame is 3 x 4 inches, black painted wood and has a recess so it looks like a box frame. I don’t normally add any covering to my miniature paintings but this frame has a perfex front. As the box of the frame is deep and the painting texture not too high in this picture the covering doesn’t come near the wax paint. As with most painting medium it is recommended that the picture does NOT touch the glass, with all my paintings, large or in miniature I recommend that if you are going to frame a piece of Art In Wax you ensure that the painting is mount in such a way that the glass does not touch the wax, equally I personally feel they look great without a covering at all, as the wax has a lovely texture and sheen. I feels only right to make the last blog post of 2015 about the last painting of 2105, this is my latest piece of Art in Wax finished today, it is a colorful landscape in encaustic wax on specialist gloss card and is a large piece at A3 in size. 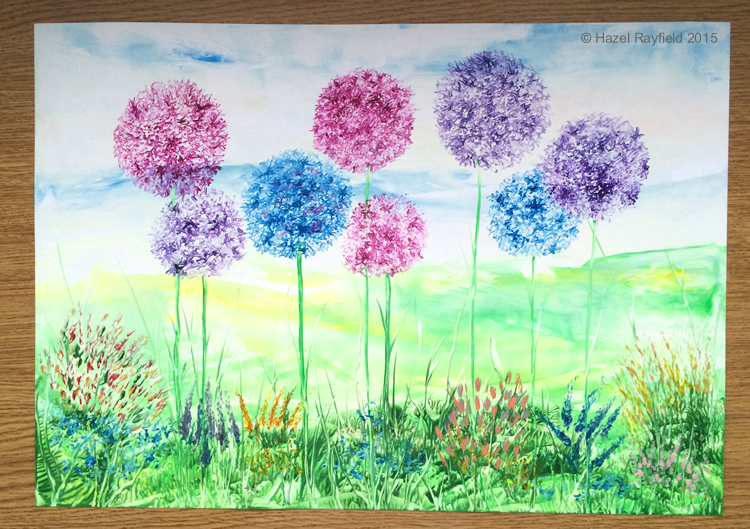 Alliums are one of my favorite flowers, I hope you like the painting, please feel free to leave me a comment below ….. I thought it might be fun to show my latest painting on the blog today. This is an A3 size picture that I have mounted in a 16 x 20 inch mount and is shown here in a frame just for display. This painting is currently for sale at the time of posting, contact me if you would like to buy it – it is £60 including the mount and UK postage but not including the frame, I am happy to ship worldwide but that would increase the postage costs. 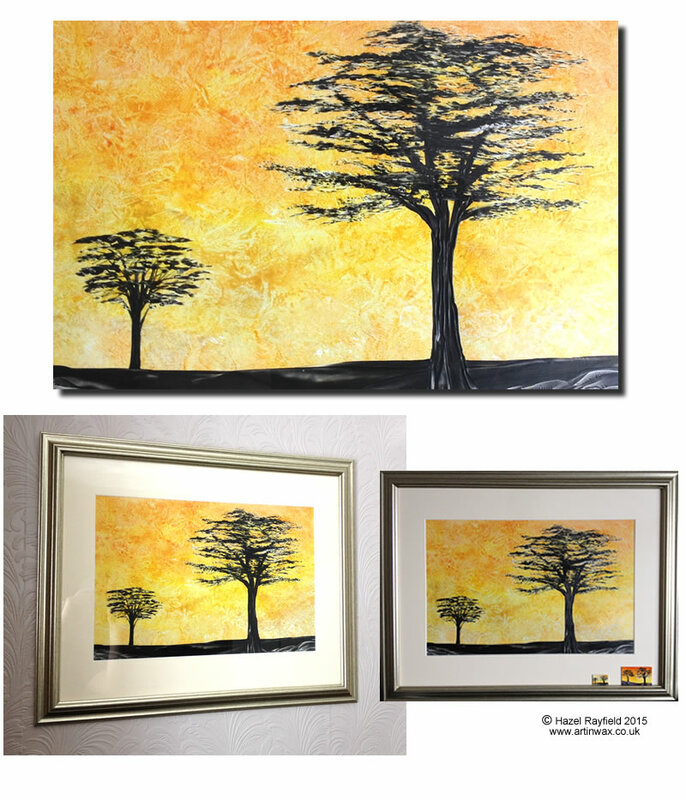 In large and miniature too …..
As you can see below there are also two tiny versions of this painting, I couldn’t resist painting smaller ones too ….. ideal for a dolls house at just 56 x 37 mm and 28 x 20 mm compared to the larger one which was 420 x 295 mm before mounting !! !